Knit sweaters are a fall wardrobe essential. If you’ve been browsing the racks for a stylish design, then look no further! Your friends at Shop With Us have spied a ribbed pullover that you’ll want to live in all season long. The Treasure & Bond One-Shoulder Ribbed Sweater is as stylish as it is comfy. Designed with an asymmetrical neckline, its long sleeves and soft blended fabric will keep you snug while braving the chilly temps. Shop this style in two colors, including beige oatmeal light heather and pink adobe. Priced at $69, you can purchase this Nordstrom exclusive without breaking the bank. Nordstrom reviewers love this knit for its slouchy fit, and we are equally impressed. Reviewers appreciate its soft and comfy feel. One shopper shared that they enjoy dressing this design up with leather pants and down with jeans and booties. Team the sweater with leggings and fuzzy slippers while curling up with a good book. If you’re looking for an office-ready ensemble, pair the top with pumps, trousers and a tote bag. 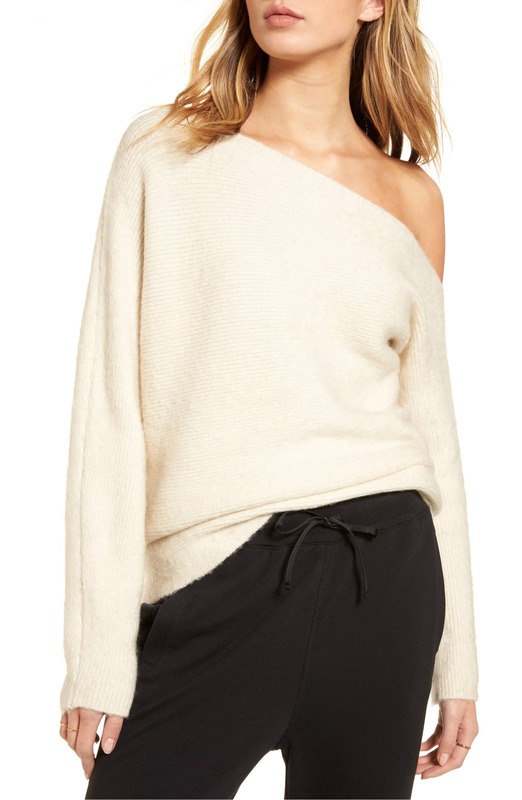 See It: Scoop up the Treasure & Bond One-Shoulder Ribbed Sweater at Nordstrom for only $69.